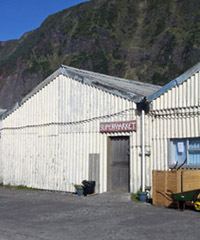 The supermarket provides essential imported products to supplement locally produced food and woollens. 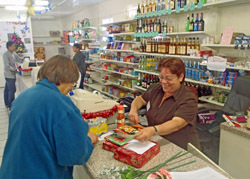 Tristan's Island Store or Supermarket doesn't have plate glass windows, or carry advertising, but it does provide essential products to supplement locally produced food and woollens. Goods need to be ordered months in advance of the arrival of incoming ships. The Island Store is normally open from Monday to Friday. 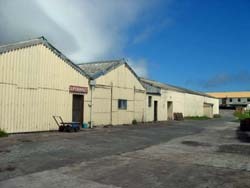 The Supermarket is still referred to as the 'Canteen' by some people as the first Tristan shop was run by the World War II Naval Station and Royal Navy shops are commonly referred to as the 'Canteen'. It was not until 1942, when the Naval Station paid cash wages that Tristan Islanders started to move from a barter economy to a modern cash economy and had the novelty then of making their first cash purchases. Today Islanders still grow their own crops of potatoes, vegetables and salad items and rear their own stock to produce beef, mutton, milk and eggs from hens and ducks. They rely on the Supermarket to obtain other foodstuffs including flour, sugar, other groceries and have the choice nowadays to buy frozen bread and a wide range of groceries typical in a UK or South African Supermarket.